Emirates Airline Festival of Literature and Dubai Opera Host Landmark Poetry Event – Emirates Airline Festival of Literature. 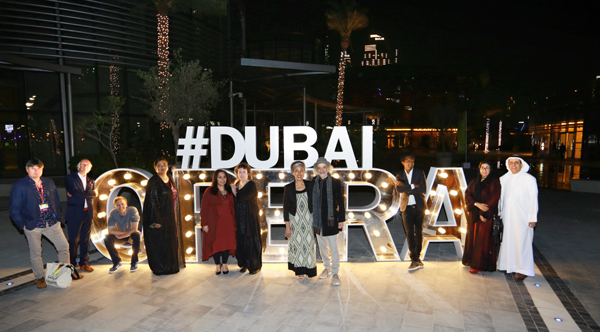 Dubai, 6 March, 2018: The Emirates Airline Festival of Literature held its landmark event, For the Love of Words, at Dubai Opera today. This first literary performance staged at Dubai Opera, was presented jointly by the Festival, Dubai Opera and the Ministry of Tolerance, as part of the UK/UAE 2017 Year of Creative Collaboration led by the British Council with the support of the UK GREAT campaign. Performing poets included John Agard, Simon Armitage, Harry Baker, Imtiaz Dharker, Carol Ann Duffy, Roger McGough, Grace Nichols, Lemn Sissay and contemporary Emirati poets Khalid AlBudoor, Nujoom Nasser Alghanem, Hussain Lootah and Afra Atiq. The packed theatre, among whom was His Highness Sheikh Ahmed bin Mohammed bin Rashid Al Maktoum, Chairman of Mohammed bin Rashid Al Maktoum Knowledge Foundation and President of the UAE National Olympic Committee, His Highness Sheikh Ahmed Bin Saeed Al Maktoum, Chairman of the Emirates Literature Foundation, His Excellency Abdulrahman Bin Mohamed Al Owais, Cabinet Member and Minister of Health and Prevention, Minister of State for Federal National Council Affairs, His Excellency Mohammed Al Murr, Emirates Literature Foundation Trustee and Mohammed Bin Rashid Al Maktoum Library Foundation Chairman, His Excellency Saeed Al Nabouda, Acting Director General of Dubai Culture & Arts Authority, Ruba Al Hassan, Ministry of Culture and Community Development, Professor Rafia Obaid Ghubash, Founder of the Women’s Museum and Sukoon and Trustee of the Emirates Literature Foundation, Gavin Anderson, Director UAE, British Council, Hannah Henderson, Head of UK/UAE 2017 at the British Council and representatives of the British Council, were mesmerised by the performances in both Arabic and English.